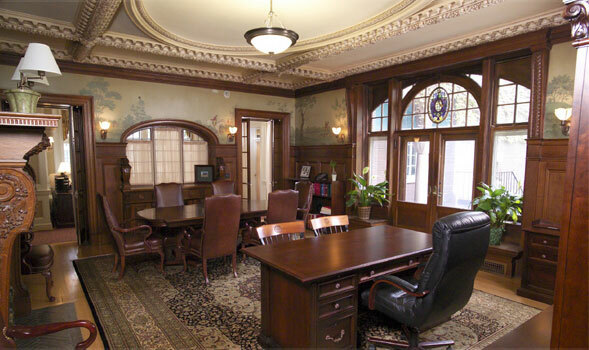 Now Patrick Solomon’s office, this room was formerly the dining room. It features a hand-painted mural depicting the family estate of Mrs. Nora Conway Todd in Ireland. The Todd family, whose Irish surname means fox in Celtic, commissioned the mural of the fox escaping the hunt. The windows over the built-in buffet separate the dining room from what used to be the morning room or breakfast room. Beautifully hand-carved Griffins adorn both sides of the arched window. Double doors open to the patio in front of the gardens.